Video Game Museum: The Video Game Museum features the largest collection of screenshots ever put together, covering the thirty-year-plus history of the industry and its many computer systems, its consoles and its arcade presence. Information, game endings, scans, sprites--they're all here, too, in abundance. It even hosts my humble site. Do you want to relive old and new gaming memories alike? Well, then, go here now. MrP's Mega Man Realm: This is my now-defunct Mega Man site. Though it won't see any future updates due to a never-ending stream of sequels and not enough hours in a lifetime, it's chock-full of images, the stories, and a lot of other fun stuff. Click the link to warp your way there. A Metroidvania Website: An adventure-based open-world genre born into existence by the popularity of both the Metroid and Castlevania series, Metroidvania is a term that continues to sweep the Internet. At A Metroidvania Website, learn about the nomenclature, the many games that populate the genre, and much more as Squalid Pumpkin walks us through an interconnected labyrinth of conceit. Zophar's Domain: Zophar's is the ultimate site for video game news and utilities plus anything else your mind could conjure gaming-wise. Keep up to date with the video game industry by visiting here. GoNintendo: As of now the ultimate in Nintendo-centric gaming news. Constant output from the overworked staff includes news, reviews, humor, and a popular podcast that always results in pure mayhem. Refresh and you will find. Nintendojo: This is one of the best Nintendo-exclusive sites on the 'net. If you like your news and views only the Nintendo way, this is one of the best outlets. News, reviews and editorials are here for your entertainment. Tetris Live: A fan-made Tetris site, featuring classic Tetris games along with 3D Tetris and Jig Tetris. Need a convenient fix of Tetris action? Well, you can't get any better than quick and free. Nintendo World Report: Here is another of the more popular Nintendo-exclusive websites. NWR presents its material in a very cohesive news-style manner and therein encourages interactivity via its message boards. Dandy2000's Sega Page: Here, at the Sega Genesis / Sega CD Games Review & Fan Page, Sega-specific gamers can find reviews, box scans and information about the company and more about its other paraphernalia. GameFaqs: Here you'll find a painstakingly enormous databank for video game information. Featured within for just about every game ever made are walkthroughs, reviews, codes, save-state files, message boards, and more. Alupaer's Sprite Page: This site is dedicated to sprite rips from Castlevania: Symphony of the Night and some popular fighting games, like Marvel Versus Capcom and Darkstalkers. Trigames: The Triumvirate: A video game site created, as the authors say, "For the love of games, boredom, and an excuse to play more games." At Trigames, you'll find articles, reviews and other media pertaining to games, brought to you by those who know them best. Console Classix: Console Classix is devoted to the systems we'll never forget. What's its main dish? The webmasters say, "We offer legal emulation of the Atari 2600, the NES, the SNES, the Game Boy and Game Boy Color, and the Sega Genesis." Retro Reality: A new venture started by famed collector Protogem and friends, Retro Reality is a website, forum, and YouTube channel dedicated to classic and retro gaming. Take it to the old school at Retro Reality. The Community Gaming Newsletter: By making your way to the Community Gaming Newsletter, you can subscribe to a weekly newsletter that focuses on the community's interest as to the latest news in gaming. The Metroid Database: MD is a fan-made site dedicated to what I consider video game's finest series. The site thoroughly covers the entire series and the on-the-side escapades of Samus Aran. News, features, strategies and fan participation are just part of the package. The Mushroom Kingdom: A compendium for all things Mario. The character, and moreover his separate series, are covered in great detail. If Mario's in it, they've got it. The fun, you'll find, is in the site's many special features. Super Mario: Blue Twilight DX: This fan-made game features the creator's unique take on classic Super Mario Bros. action. In addition to familiar elements, the game features two special hidden bosses, one of which is Castlevania mainstay Count Dracula. Cluttered Games: Cluttered Games is a Youtube channel that features video game reviews, Let's Plays, 3D animations, and much more! As the site owners tell us: "Cluttered Games is run by four guys who love to give others a laugh and entertain others. We love video games, and we hope you give us a look!" New Gamers: This is a Dutch gaming website that gives you all of the basic information you need to know about games, gaming and gamers. "We have our own Hall of Fame, a History of Videogames, a section on how to become a programmer, and much, much more." IGN Gaming Network: The IGN network covers every major video game system with up-to-date information, endless media, and dozens of feedback outlets. The best of IGN's material can only be found on its premium site. GameSpot Video Games: Many people prefer this site to IGN's vast network. GameSpot is equally huge, with previews, reviews, movies, guides, superior interactivity, and more. It, too, has a premium-based service, but its all-access material is more plentiful than IGN's. The Official Konami Site: The North American site of the company that created Castlevania and furthermore one of the greatest game series ever. Depending on your knowledge of linguistics, you can also browse the sister sites that cover other continents. See "Other Sites" links for help. Dracula's Curse: The Page: The site devoted to the masterpiece Castlevania III: Dracula's Curse--the best Dracula's Curse page in existence. Every page from top to bottom is structured like and reminiscent of the game that set the series on a new level. Need to feel like you're playing the game, or maybe have an insatiable craving for Slogra and Gaibon? Head right over here. 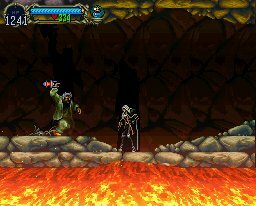 The Castlevania Dungeon: One of the first sites I stumbled upon when I was introduced to the web, and I visited it quite frequently to the point where it inspired to make this site. Enough said. Check it out if you have the time--and you know you do. The Castlevania Wiki: The Castlevania Wiki is a community-managed site whose many users collaborate to share with you an exhaustive amount of information about every aspect of the Castlevania series. The games, the stories, the characters, the geography, the weapons, the movies, the comic books, the merchandise--this all-encompassing information source has it covered. Konami Castlevania Database: A subsection of Konami's official Japanese website, this page acts a portal for all of the (modern) individual title's official websites. Available, too, is information for creator blogs, the series' official timeline, soundtracks, and more. Castlevania Legacy: For custom-made images, character animations, interactivity, and excellent Castlevania family tree and timeline pages, the Castlevania Legacy website is where you want to be. The Castlevania Attic: A Castlevania site that seeks to bring about the revival of the Castlevania Worldwide Network. Here, you will find character information, Castlevania MIDI files, a Castlevania RP and Castlevania humor. The Inverted Castlevania Dungeon: Says the author: "ICVD is the site no one wants to admit having visited, a site full of information on the series; though, most of it should be taken with a grain of salt. The site also features comics, random columns, and a lot of sophomoric humor." Chapel of Resonance: The Chapel of Resonance is more than your standard comprehensive Castlevania fansite: It manages to stand out with its cool animated headers, smooth design, and Wiki-style presentation. Give it a look if you like some soul with your substance. Rikardo G.'s Castlevania Planning: Aspiring game-creator and Guinness world-record holder Rikardo Granda shares his Youtube playlist of videos detailing the planning stages for his entry into the world of creating Castlevania games. The Castlevania Graveyard: This blog-styled fansite features updated news and opinion pieces for everything taking place in the worlds of Castlevania and Konami. The Castlevania Villa: This is a very off-the-wall Castlevania site full of humor and lots of fan stuff. As the humble site master says: "It's worth a look." The Akumajo Dracula GSV Project: Longttime series' fan and collector Akumajo brings to you a site to showcase rare material--CDs, books, movies, and other artifacts. Nashounet's Castlevania: This is another French Castlevania site, and this one also thoroughly covers the whole series, generally, and some homemade games. In the author's words: "A French site about Castlevania which is not in black and red." MegaVania: The Musical Experiment: Cyberdragon10k puts together a seven-part Youtube feature that explores the connections between the Mega Man series and Castlevania II: Belmont's Revenge, marrying the two in a most unique way. Castlevania Central: A site that provides information and resources for all of the games in the Castlevania series. For the moment, it is partially incomplete yet always growing. Castlevania: Chorus of Mysteries: Chorus of Mysteries, created by Dr. Mario and optomon, is an extremely in-depth rom hack of the NES classic Castlevania. New enemies, new bosses, a new soundtrack, and new gameplay mechanics--it's a whole new experience. Linnavaanijat - Castlevania: The authors bring you the first ever Finnish Castlevania fan site. It's here where "those who lurk in the castle" bring you an ever-growing community offering columns, reviews, information and music. Castlevania Museum: The Castlevania series rocks, as they say at this message-board community, within which you'll find boards for popular consoles and individual series titles. Castlevania: Curse of the Clock Tower: This is a forum-type community (in Spanish, English and French) where series' fans can gather for discussion or to help in the trading of series-based resources. The webmaster hopes to build a large community. Castlevania: Aria of Shame: In the making is a large community dedicated to the series and to video games in general. As the forum's keeper tells us: "This is an awesome Castlevania message board." Castlevania: The Forgotten Son of Dracula: A fan-made movie trailer that sets the stage for the group's upcoming film. The piece blends together game sequences, live action, and some familiar music tracks. "It's gonna rock," the group promises. Castlevania: Crescent Moon Concerto: Author James Haley brings you this fan fiction (a still-unfolding tale), which documents the continuing adventures of Richter Belmont. Also included is a castle blueprint, a custom map, and the author's chapter-by-chapter notes. Beyond Limitations: Our (my brother and I) "Full Publishing Services" site dedicated to making young writers' dreams come true. At your behest: Editing (by yours truly), publishing and step-by-step instructions on how to bring your stories to life--everything you'll need to start your career. Temporal Anomalies: A fascinating site created by M. Joseph Young that looks at the complexities and sometimes impossibilities of time travel using famous movie series such as Back to the Future, The Terminator and Bill & Ted's Excellent Adventure. How much can you read before your brain melts? Whatever--you'll have fun doing it. You're the Man Now, Dog: Based on the unintentional comedy of Sean Connery, YTMND is a humor site whose users combine imagery, animation and music to create hilariously random displays that entertain, defy all common sense, and definitely "push it the limit." Backgammon Strategy: Head on over and imbibe in one of the premier resource centers and information base for all things Backgammon, one of the world's oldest table games. Toxic Memories: This is a blog featuring user Toxicpunkette's thoughts on a variety of subjects. Content also includes game reviews, random videos, and games. Translated Web Pages: Have you ever wanted to read a page that is typed out in another language? If you visit this section of the Google's website, you'll find the tools that'll allow for just that. And, if you'd like, you can see what my page looks like in other languages. If you'd like to see your site listed on this page, contact me at MrPerfectn@aol.com with the link and the description you want for it. I'll list it here provided that it's a Castlevania site or a video game site in general. If you'd like to link to either my site or A Metroidvania Website with more than just text, feel free to use one of the banners below.